Closed: Complete 5 months ago Opened 2 years ago by jflory7. Originally discussed in fedora-commops#92, Fedora Diversity FAD 2017, fedora-diversity#4. For one week during the year, Fedora contributors would have a special event where they are encouraged to give their thanks and appreciation to other contributors in Fedora. If you want the full background of everything, I would recommend going through the three links at the top of the ticket, or poking around the references at the bottom. This new ticket intends to bring all of the current information together and refocus for organizing a Fedora Appreciation Week this year. The goal is to celebrate a week of appreciation for the contributors who help make Fedora what it is. This can be from a development, infrastructure, marketing, engineering, or any relevant standpoint. During this time of appreciation, users and contributors alike would be highly encouraged to select either a single or group of contributors to thank for their efforts in the Project. There is a long-term and short-term component to this ticket. The long-term vision is better explained here. This ticket is looking more short-term at what we have to do in order to complete this in 2017. A few links for browsing or reading more. A lot of the Appreciation Week is still abstract (or not very well-defined). To move forward on this, we want to come up with some concrete action items to work on over the next few months to move forward on the event. During the meeting, we agreed on some planning updates for this year. Before, there was an idea about a wiki page as a "wall". On this wall, anyone could leave friendly comments or compliments to specific Fedora contributors, to teams or sub-projects, or to the project in general. However, there's complications with using the wiki without being CLA+1 and it's also not intuitive. Instead, we figured a lot of people are already on Twitter / other social networks, we could use a hashtag and encourage people to post their thanks / appreciation onto a social network using the hashtag. We could then sort through all of the posts using the hashtag and display them or make a word cloud. I prefer the one with the year because this is an annual event independent from the release cycles, and there's also a chance that F27 could be delayed another week, which would leave us running the event during F26. We briefly discussed the idea of having a badge to award people who use the hashtag on a public social network to say thanks. This would probably be a manual task, where CommOps team members monitor major social networks using the hashtag and award the badge, or an individual comes to us with a link to their post to get the badge. We decided to revisit this at a later meeting, after other details are finalized. In early October, we agreed to run a Community Blog post to promote the event and get it onto peoples' calendars. The article would have some basic information like when the Appreciation Week will be, what you can do to give thanks, and mention things like the hashtag. Ideally between 400-500 words. This is currently an open item, but we wanted to follow up with either @x3mboy or @cprofitt to see if they might have the cycles to help. I know @cprofitt had an interest in helping before. We'll revisit this at the next meeting. Tweets are short and we're asking for a thoughtful appreciation. I am +1 for WeAreFedora if we want to go for a reusable hashtag. It was mainly from a metrics point of view that we wanted to add the year or fedora release. I am -1 for Fedora as a hashtag. People can tag the public Fedora social media account so it can be linked to us. As a hashtag, it can be too noisy - with the fedora hat and different other meanings/ use cases for the word or with generalized fedora tweets. It depends on how eloquent people want to be. We can suggest people to use multiple social media platforms like Twitter, Google Plus etc. some which offer more writing space than others. Additionally, we can suggest that they can also tweet with URLs if they write blog posts thanking someone with a small intro. Social media platforms will help us measure the activity and impact without requiring too much infrastructure for this year. However, we need to decide on the platforms and promote them in our CommOps blog post accordingly - for people to use them and for us to be able to measure it later on. @x3mboy Also suggested having something like a Happiness Packet Challenge during the Fedora Appreciation week to engage more people with the event. (1) By Oct 2. Suggest and vote on event details like platform for event, hashtag, date etc via ticket. We can suggest people to use multiple social media platforms like Twitter, Google Plus etc. some which offer more writing space than others. Additionally, we can suggest that they can also tweet with URLs if they write blog posts thanking someone with a small intro. This is a great idea. Even with a longer hashtag, people won't be restricted by the writing space on Twitter. A huge +1 for this. Discussed at the CommOps 2018 FAD. We revisited Fedora Appreciation Week and mapped out a plan to implement a first run in 2018. The emphasis during the FAD was to create a realistic, short-term plan to launch the event this year. Ownership doesn't mean others can't contribute - we would love to include you! @bee2502 drafted the Appreciation Week template and we approved it during the meeting. I plan to add the template to the contributor-stories repo next. I need to learn how to do this. A first draft is due by Monday, Feb. 26, 2018. This is keeping us to our timeline discussed in the FAD for February. @bt0dotninja wrote an introduction to the contributor stories idea for Fedora Appreciation Week, as mentioned above. Please review the draft and share any feedback on the article here in this ticket. Any requests for feedback are due by our next meeting on Monday, March 26, 2018. After that, we will schedule it for publishing. I need to add the story submission template to the contributor-stories repository. Someone who files an issue (i.e. story) on the repo will see the template. 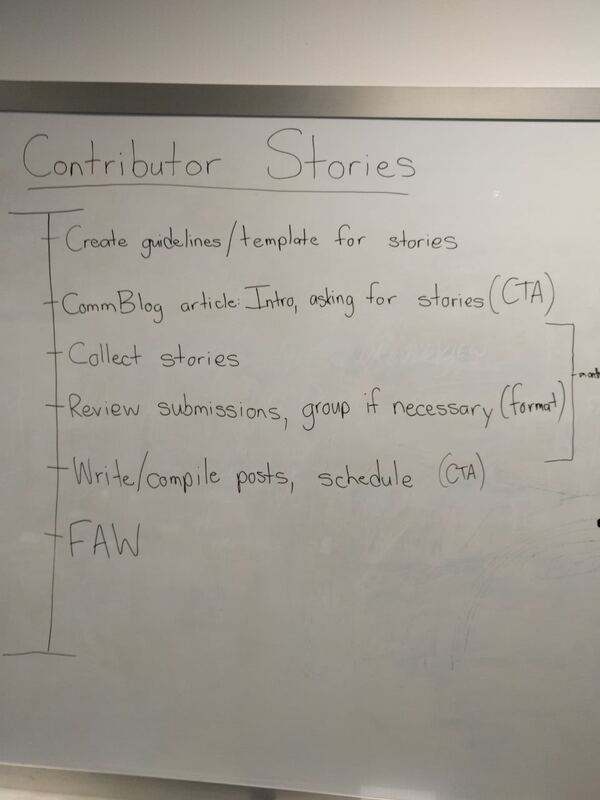 I aim to do this by next week's meeting, so this will not block the contributor stories intro article. We briefly revisited this today. We still have the same two actions as above to move forward. @bt0dotninja will share a request for review on the CommOps mailing list this week. The template and a README for the repository are both due on Monday, April 2, 2018. I passed up this task because I have a lot on my plate now (I still need to ship the FAD report and CommOps Year in Review). @wesleyotugo and @bt0dotninja are tag-teaming to add the template from the Etherpad into the contributor-stories repository. There is documentation on how to do this in Pagure. Both @wesleyotugo and @bt0dotninja should have access to do this. @x3mboy is also going to submit a PR to the contributor-stories repo to add a README. Both the template and the README are due to be complete by the next CommOps meeting on Monday, April 2, 2018. @wesleyotugo @pingou @jflory7 @bt0dotninja I have added the template as reflected in the etherpad. Please retest. @bex Thanks! this works now. How did you do it? The ticket template is live – the ball is back in my court to review @bt0dotninja's article to announce the contributor stories. Oops, I forgot to comment here this morning. In the meeting, we mostly did a quick check-in on this ticket. The repo for collecting contributor stories is now set up and ready to collect new stories. @bt0dotninja finished the draft and it is pending review. I'm hoping to review this week. Would we want to publish this later this week or the next? The contributor stories introduction article publishes Tuesday, May 1, 2018. To support the article, we will do extra outreach to help make the article more visible. I will help with Twitter and rounding up some others to socialize the post on Facebook / G+ / etc. @jonatoni will help with Instagram. @bt0dotninja will write an email to the announce@lists.fp.o mailing list. We will do this outreach at the end of this week (e.g. Friday, May 4) or at the start of next week. Fedora 28 releases tomorrow, May 1st, so it's unlikely anything we share tomorrow will be seen. We know the Perceval GSoC plugin is no longer possible by Flock. We've spent a lot of time developing and promoting Contributor Stories. As of now, we have collected seven, which is enough to use as examples and promote them further. If we can double the number of contributor stories by November, I think we will be in excellent shape. Otherwise, for now, I think it is best to focus on the actual logistics and orchestration of Appreciation Week. We want to grow awareness inside and outside the Fedora community about Appreciation Week. Also, having it be a talking point at Flock would also be helpful to get additional buy-in from other contributors outside our team. A while back, I was actioned to write a new article about Fedora Appreciation Week on the Community Blog. I plan to publish this in July (I'd like to time it close to Flock so it will hopefully be fresh on peoples' minds at the conference too). I started a draft on Google Docs for now. I'm going to make a start on the article there and then ask for feedback as I make progress. Once we are happy with the content, we can move it into the CommBlog. Setting a deadline for this by Sunday, July 22, 2018. The next meeting should focus around the logistics of Appreciation Week. Think of it like this: what is our game plan for Monday, November 5, 2018 (Day 1 of Appreciation Week)? How do we kick off the event? What things should be in place by then to ensure the launch is a success? Maybe even more importantly… what is success? What does it mean? Knowing what we are aiming for will help us keep on track as we move closer. Unrelated, I just noticed this year will be the 15th anniversary of Fedora – sweet! Discussed at Flock 2018 and in 2018-09-03 meeting. At Flock, we reviewed and updated our roadmap / timeline for Fedora Appreciation Week this year and reviewed collaboration possibilities with the Marketing team. A final draft of the FAW announcement article (Say thank you this November during Fedora Appreciation Week) is available on Google Docs. Please review the draft and leave any feedback before Thursday, Sept. 13. It will be scheduled for Tuesday, Sept. 18. The announcement was ported to the Community Blog (see the preview here). Thanks everyone who reviewed the draft. The article is scheduled for Tuesday, Sept. 18, 2018 at 08:30 UTC. I've filed tickets against the required designs and the badge. In the meeting, we discussed the idea of using Nuancier to run a community submission contest for photos to submit. Pictures would show Fedora community members or past Fedora events (anything people want to share that shows what Fedora is). People can vote for their favorites and we can feature them on the CommBlog during Appreciation Week. @bt0dotninja is going to look into configuring / running this. I'm going to help start a conversation with pingou on how we can make this possible. See related PR #185 to add a new page for Fedora Appreciation Week. Feedback and review welcome in the PR. Today's check-in was short. We're waiting for follow-up on the design tickets and to discuss using Nuancier with @pingou. A common header for CommBlog posts during Appreciation Week needs to be done but may slip into October (based on our timeline). Otherwise, everything seems to be on track. Discussed in 2018-10-03 and 2018-10-10 meetings. It would be great to use Nuancier and we still want to investigate its use for the future, if possible, but getting to the bottom of model release agreements and whether we could use it (per @duffy's comments) isn't something I think we will solve this month. For reference, @nb shared this blog post on street photography do's and dont's. It might be helpful to revisit whenever we do pick up this conversation again. As a short-term compromise, we started a new Discourse thread to solicit photos from people to use on the Community Blog. We'll see what kind of reactions we get from this thread. I am actioned to get drafts of the contributor story excerpts ready by the end of the month. Then, we can schedule and forget during the actual FAW week. A Fedora Magazine article draft was submitted to the editors yesterday (see preview here). Aiming to publish during week of Oct. 29. Note to self: Featured image currently uses the logo-in-progress by the Design Team. Need to update the featured image once logo is completed (I went ahead and did it now because I'm traveling for the next week and won't have time until next Tuesday). The first contributor story CommBlog article is drafted. This draft would publish on Day 1 of FAW. It includes excerpts from submitted stories. See more on Discourse. I also asked a few others to write a Contributor Story. Hopefully we can get a few more. @terezahl and @duffy are currently working on the Fedora Appreciation Week logo and a working version is now available. See design#615 for more info. @jflory7 should we close design#619? also, the model release form issue isn't nuancier specific. @duffy Sorry I haven't replied there yet. It won't happen this year but I want to revisit using it in the future and you left a lot of helpful feedback. I want to archive this somewhere so we don't forget your comments in the future, but I haven't figured out where to put your feedback yet. Discussed in 2018-10-31 meeting. See Discourse thread for more detail. I drafted and scheduled five days of Contributor Stories on the CommBlog and scheduled tweets on the @fedora Twitter account to go along with them after they publish. FAW 2018 Day 1: "Community makes the difference"
FAW 2018 Day 2: "Change the world through Open Source. He said." FAW 2018 Day 3: "Becoming part of Fedora family because of her!" FAW 2018 Day 4: "You know you can do it"
FAW 2018 Day 5: "Encouraging crazy ideas"
I read through them. Fantastic work @jflory7 I appreciate all of the hardwork that went into making this happen! We did it!! Thanks to everyone who has been a part of this year’s first-ever Appreciation Week and helped make it a success. Thank you! ¡Gracias! Please share feedback for this year's FAW on this Discourse thread.